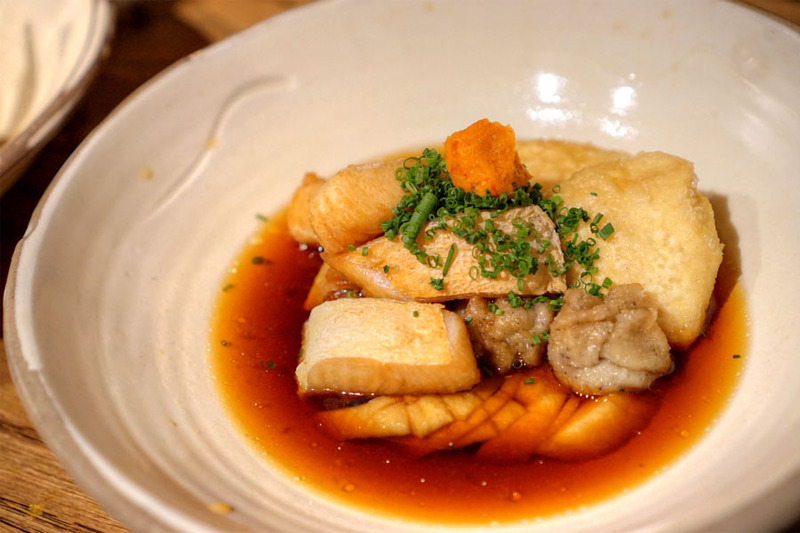 In terms of off-Strip Las Vegas restaurants, Mitsuo Endo's seminal Aburiya Raku in Chinatown pretty much stands at the top of the heap. Given that, I suppose expansion was the next logical step. 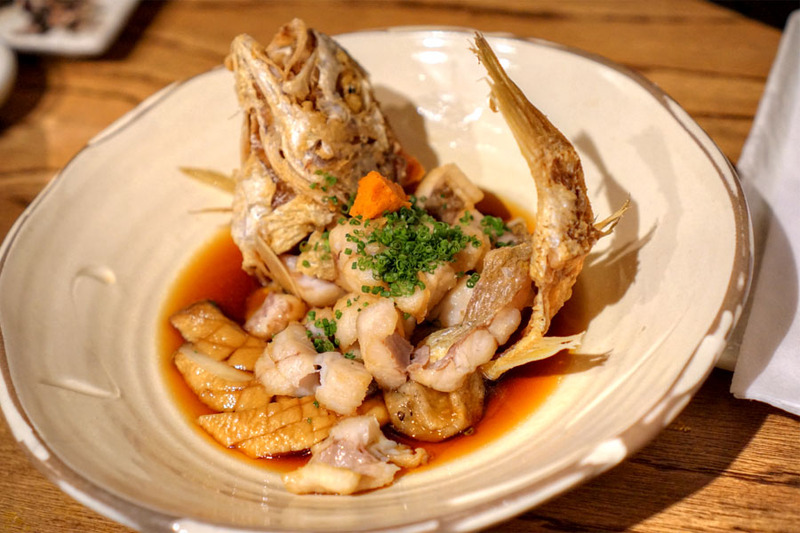 In August 2013, Endo opened Sweets Raku, a dessert-focused joint helmed by Pastry Chef Mio Ogasawara, but bigger news came last summer, when it was announced that he would debut a Los Angeles outpost of Raku by the end of the year. He held true to that promise, and the restaurant dropped in September after a surprisingly quick turnaround. 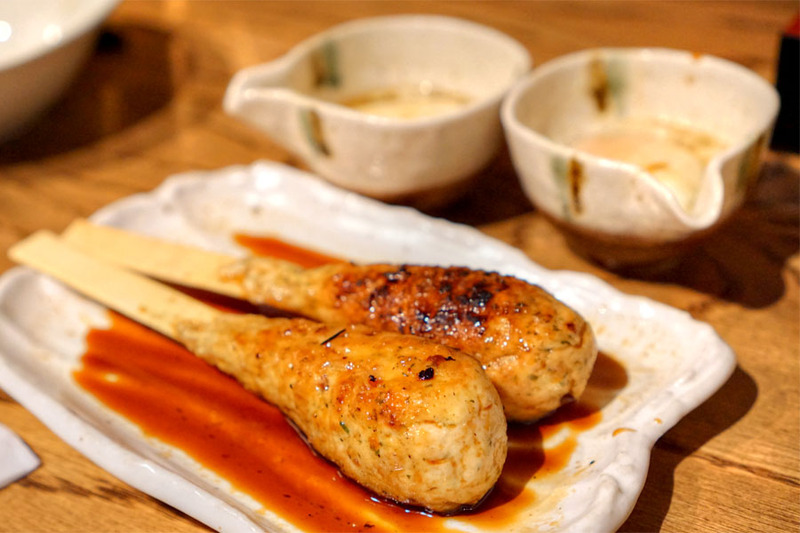 Raku takes over the old address of the longstanding Yabu, just up the street from Micah Wexler's old stomping ground Mezze and a stone's throw from Lucques. Dominated by its open kitchen, the space has been redone to a homier sort of aesthetic, with wood abound and a cozy patio to the side. 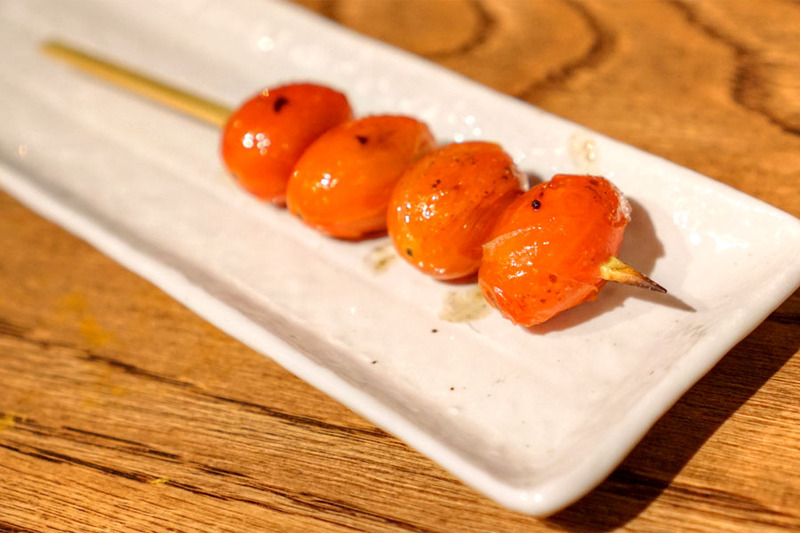 The menu will be familiar to those who've visited the original restaurant, with its listing of izakaya-style favorites and special emphasis on kushiyaki. There are omakase options here, but I prefer to go à la carte given that omakase items are largely chosen from the regular menu. Note also the specials boards, which are brought tableside for presentation. Drink-wise, sake's the clear focus (they have one of the longest lists I've seen), though beer and wine are available as well of course. Click for larger versions. 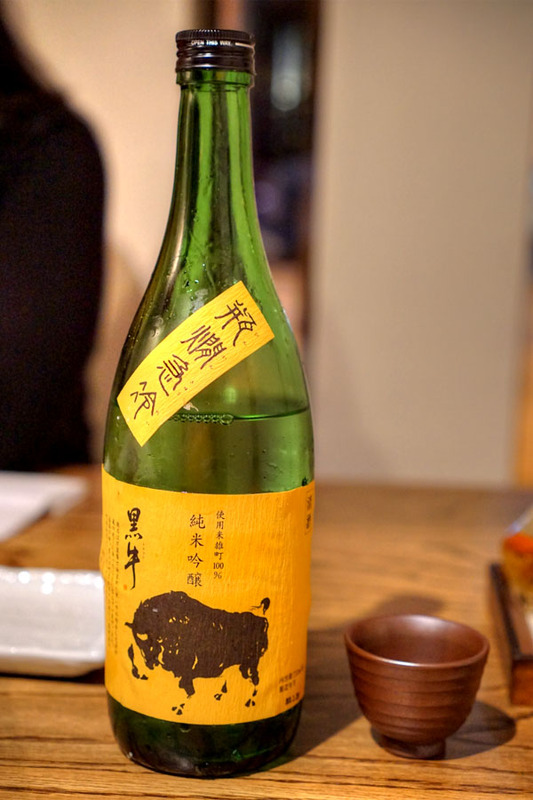 Our first sake was the Kuroushi Omachi Junmai Ginjo [$75] from Wakayama's Nate Shuzoten. I quite enjoyed it, its sweet, floral, super aromatic nose giving way to a melon-y fruitiness on the palate, with just a smidge of boozy heat coming in on the back end. 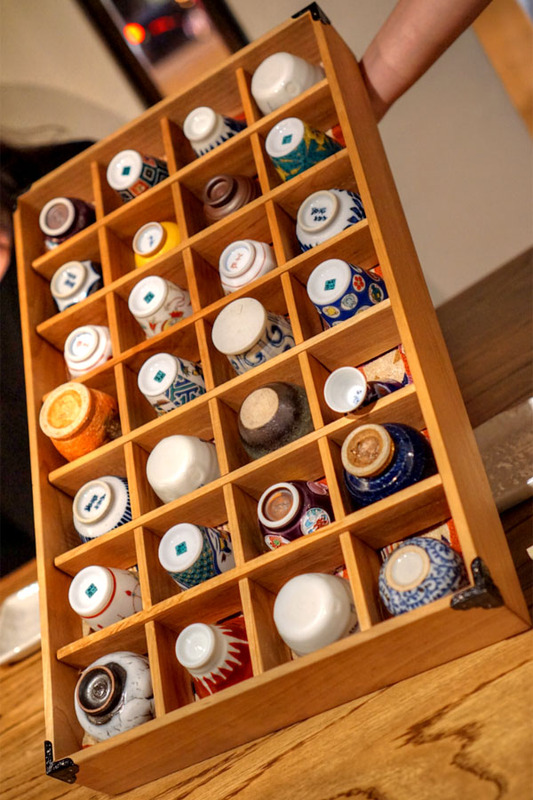 Note, also, the eclectic selection of sake cups that you're offered--a fun touch. Ibérico cheek made for some tasty morsels, a marriage of savory flesh, fat, and char with a distinctly sweet undertone. 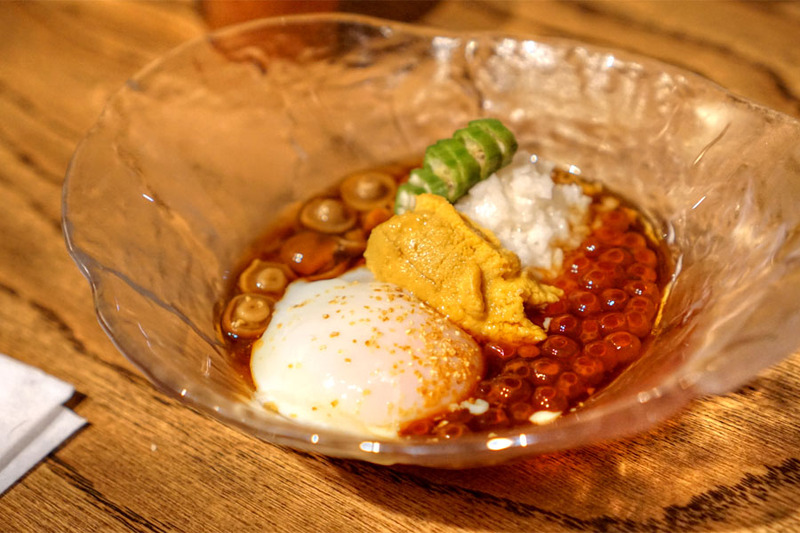 A study in sliminess, this next course combined the richness of uni and runny egg with the mucilaginous qualities of yamaimo, the ikura adding some well-placed pricks of salt. Nice bit of crunch too from the okra. 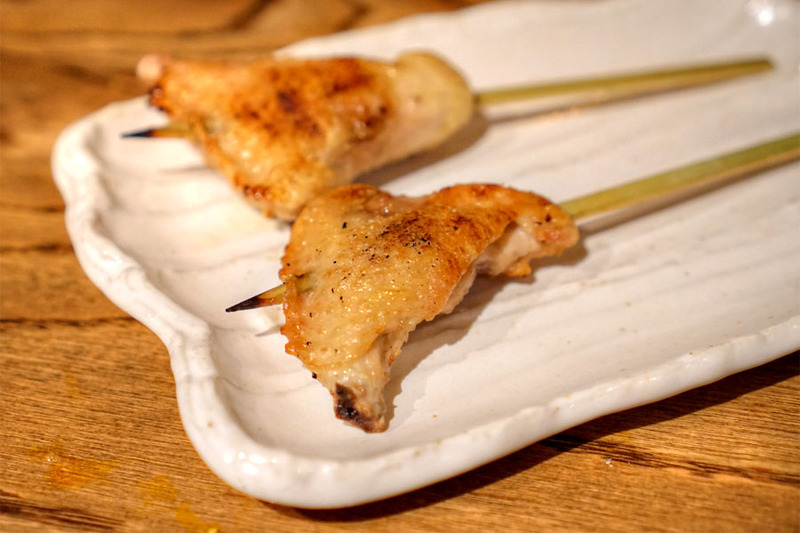 Tebasaki was a favorite of ours: juicy and tender, with an explosion of savory, smoky flavors. Pickles offered up a crunchy tartness, balanced by some deep umami notes. Light, loose-packed chicken meatballs were loaded with savory-sweet flavors along with a tangy, herby quality while a dip in the accompanying egg imparted even more lushness. 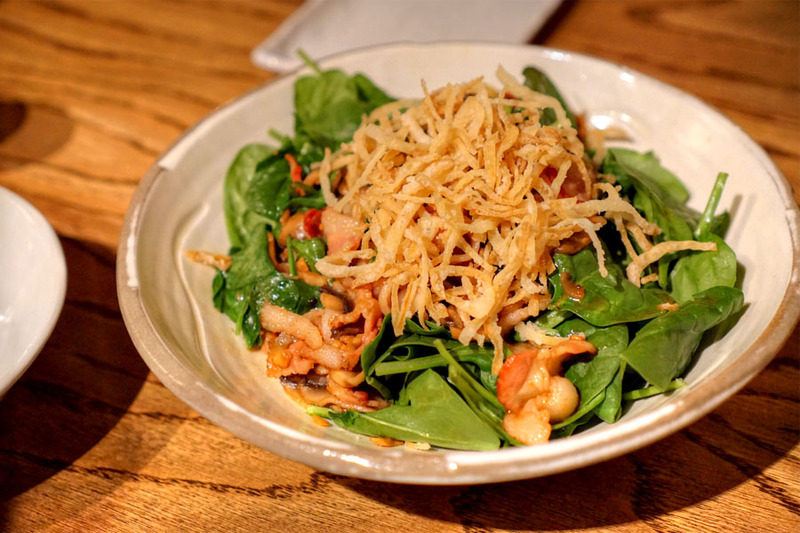 I wouldn't typically order a spinach salad, but this turned out surprisingly well, with the rich, salty bacon really enveloping the dish, the bitter greens serving as a contrast. Great crunch from the fried onion bits on top, too. Tomatoes were juicy and sweet, with a touch of char astringency. 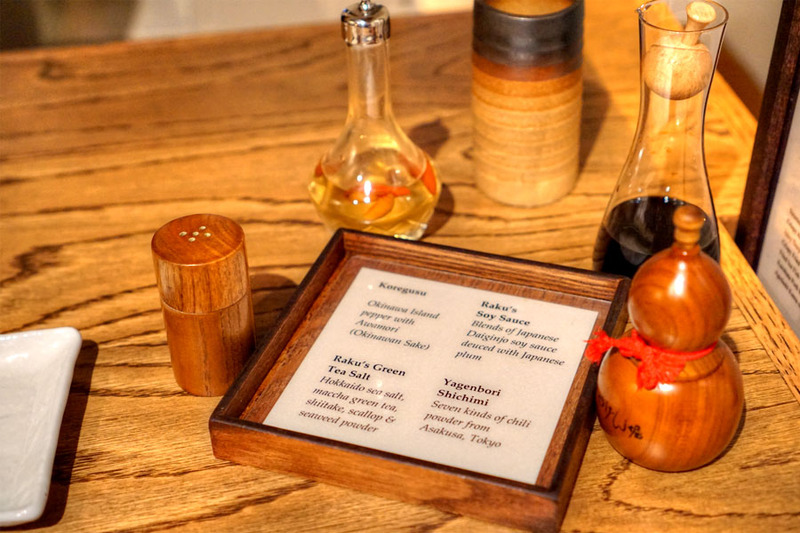 The tableside condiment offerings. I was particularly fond of the shichimi. 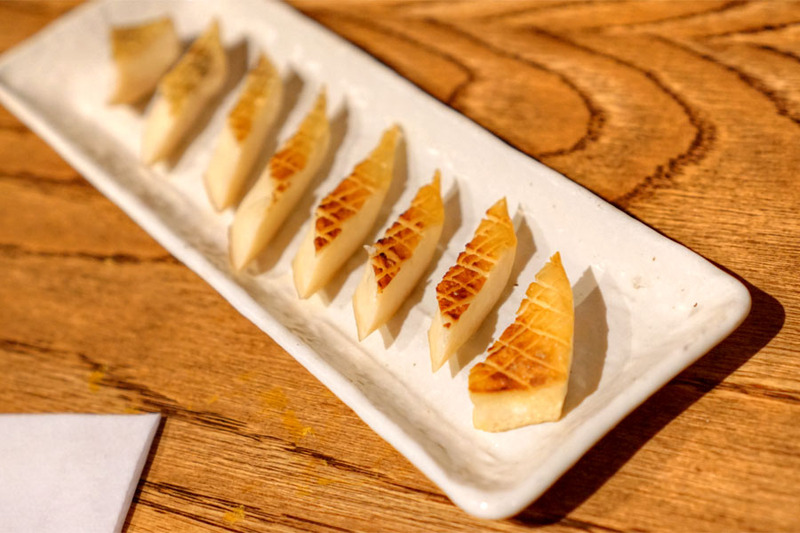 Raku's signature agedashi tofu didn't disappoint. 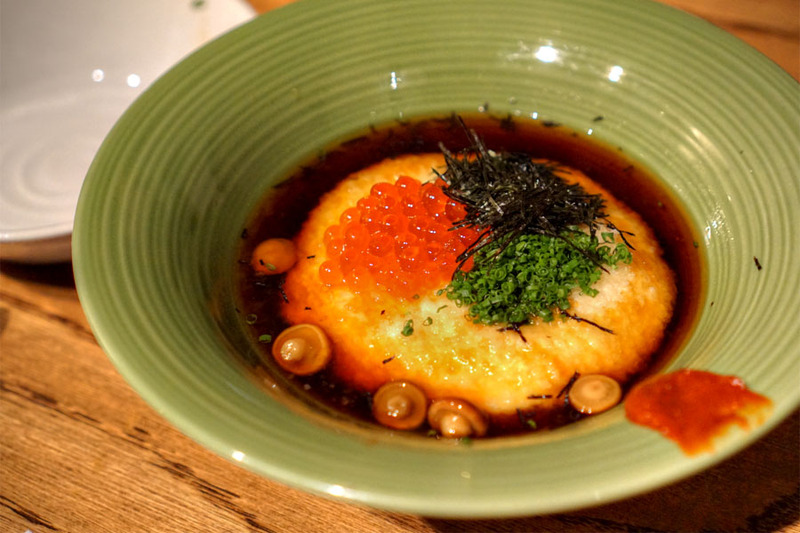 Texturally, think a savory, crisp crust hiding a creamy, silky, mild interior, all enrobed in a tangy-savory tentsuyu broth while ikura, nori, and scallion added further potency to the mix. A must-order. People often say that bacon makes everything better, and indeed, here it added a great bit of salt and smoke to the tomatoes above. 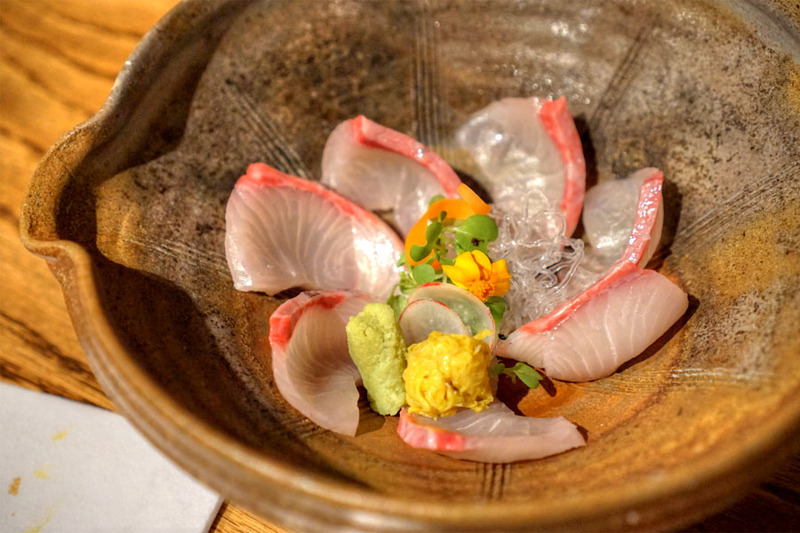 Amberjack sashimi was pretty much flawless, the clean, creamy fish meshing swimmingly with the heat of wasabi and piquant pickled chrysanthemum. Mushrooms were spot on: firm yet supple to the bite, with loads of smoky, earthy flavors. 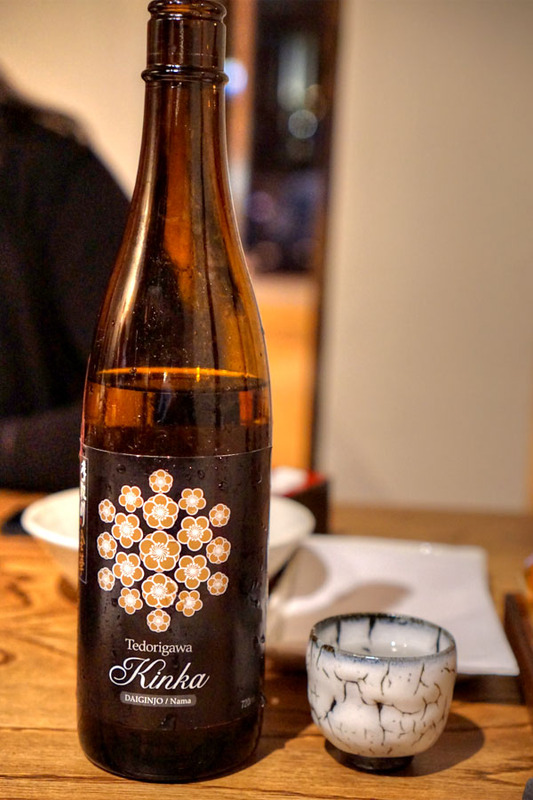 Our next sake came from Yoshida Brewery in Ishikawa, the "Gold Blossom", Tedorigawa "Kinka" Daiginjo Nama [$76]. I found it bright and fruity to the smell, while the taste brought more focused fruit and a slight booziness, along with an intriguing "minty" character. I was a big fan of the bamboo as well thanks to its delightfully crunchy texture and traces of smoke. 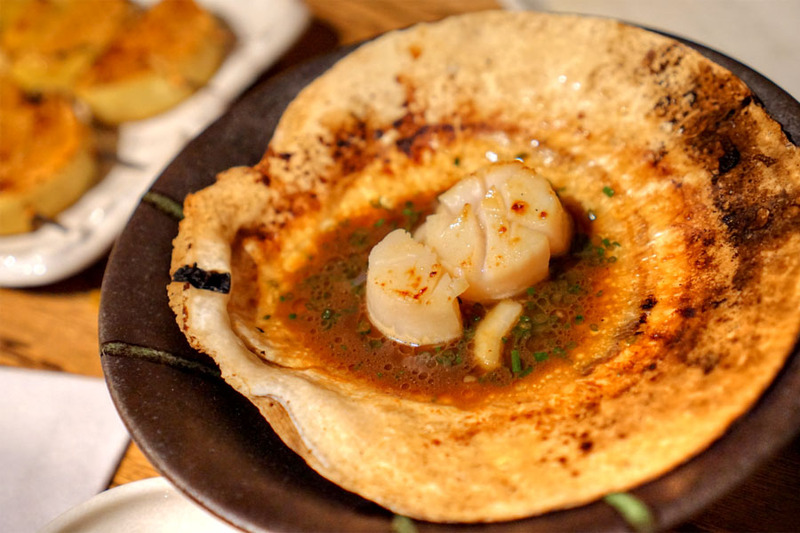 Scallops were delish, coming out all briny and legitimately buttery, the soy sauce adding even more punch to the dish. A special this evening, grilled opaleye ate very well, arriving moist and just the right amount of saline, with some great charring going on as well. 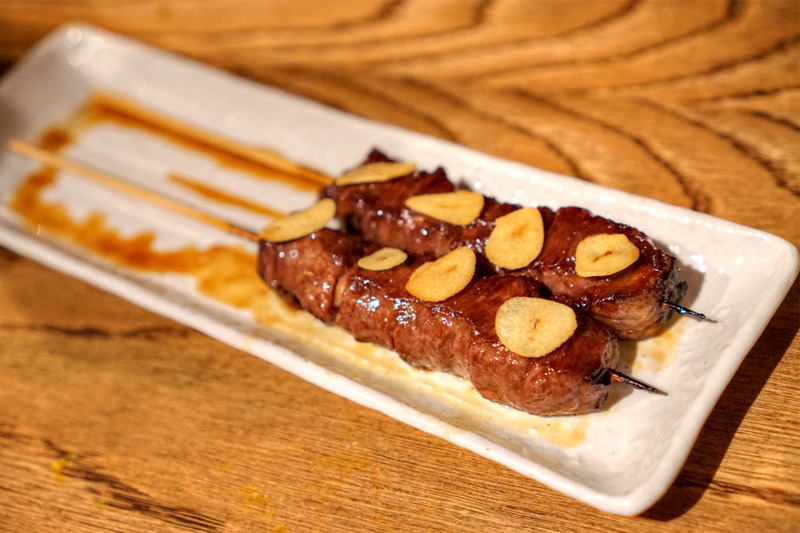 The beef skewer was leaner than I'd prefer, though I did find it tender and delicately-flavored, with a tasty hit of garlic on the finish. 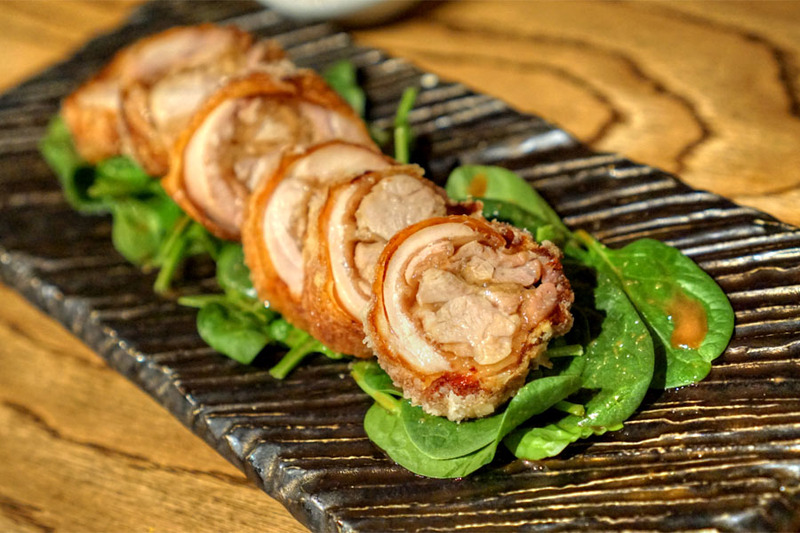 A sort of fried chicken roulade was a highlight, the bird coming out super tasty and super satisfying, with some great textures to boot. 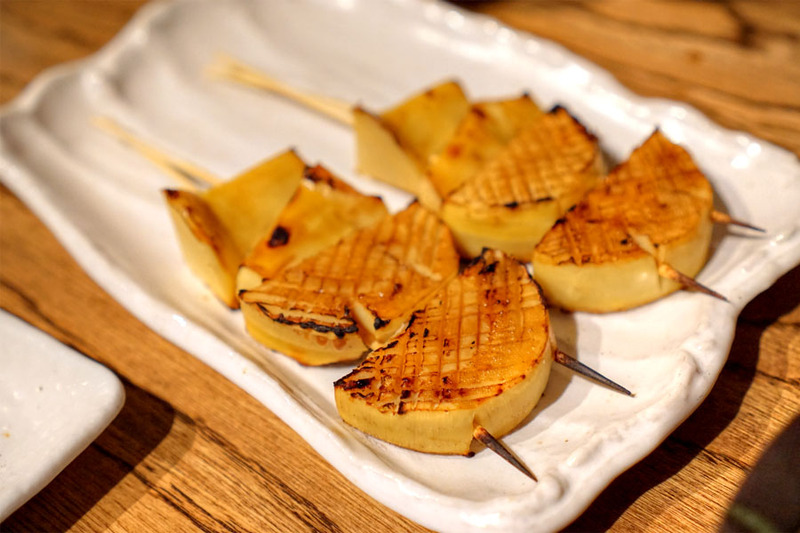 Hamachi belly was given the age treatment here, the luxuriousness of the fish evened out by the comparatively mild tofu and bite of the 'shrooms. A tasty but surprisingly light and restrained foie custard arrived topped with a delectable slice of duck. 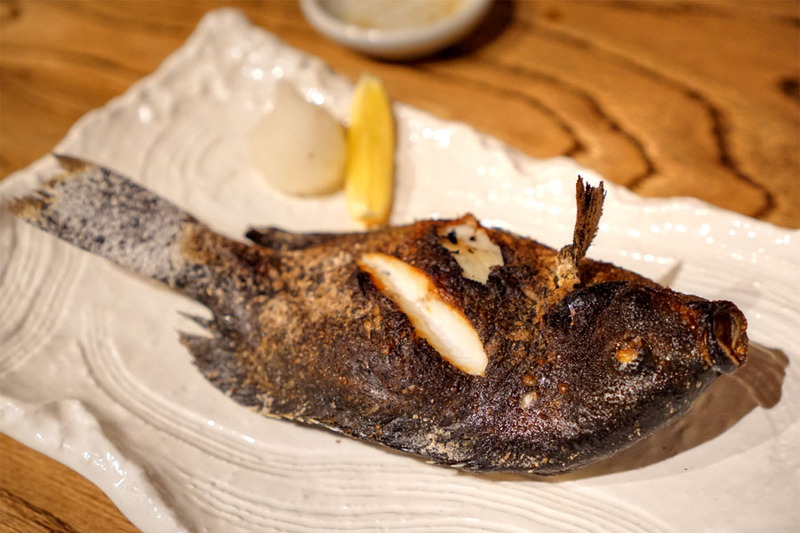 Our last dish before dessert was a whole fried white croaker, a well-textured fish with a rather profound savoriness to it that recalled those Chinese dried fish snacks I used to have as a kid. 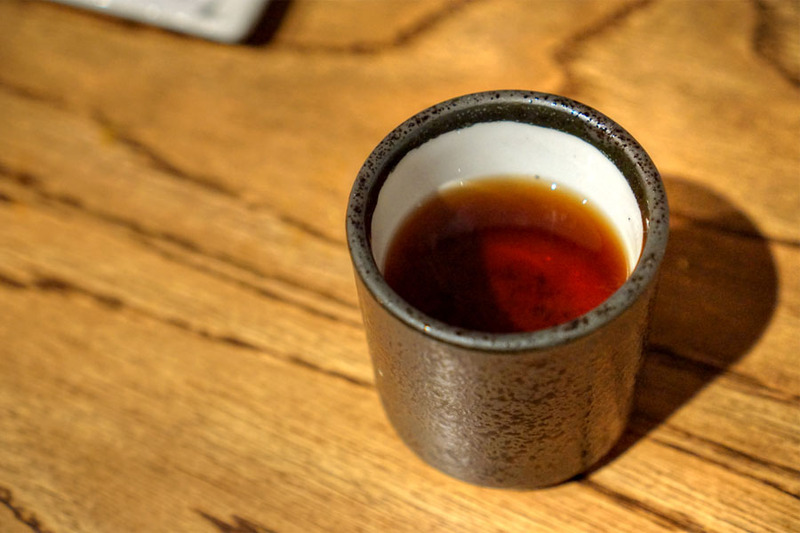 Hojicha [$2.50] made for a bitter, roasty contrast to the sweet stuff below. 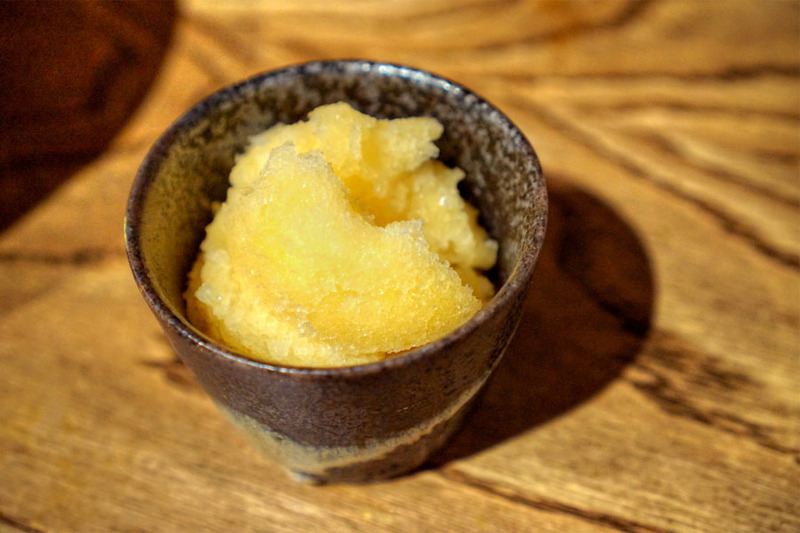 A mandarin sorbet showed off true-to-life citrus flavors in an icy, refreshing format. 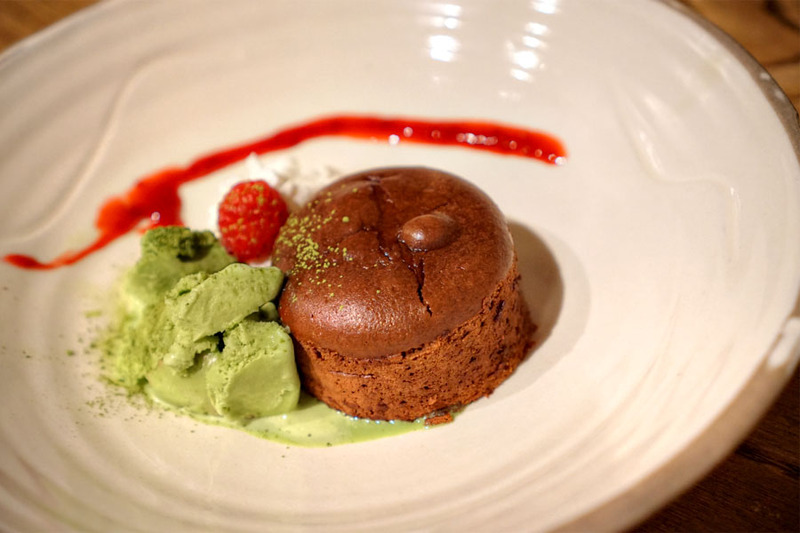 The richness of the molten chocolate cake was offset, fortunately, by the bitterness of the accompanying green tea ice cream. 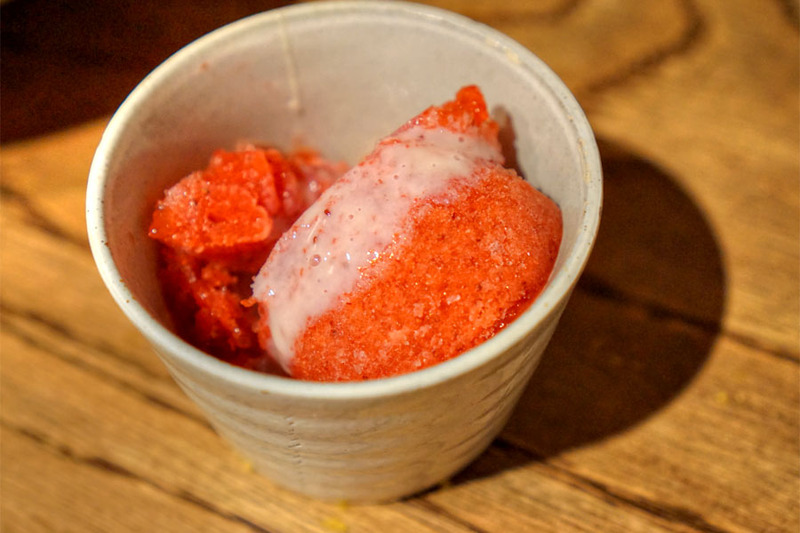 A strawberry sorbet was super fruity, super jammy, with its tart-sweet taste augmented by drizzles of condensed milk. 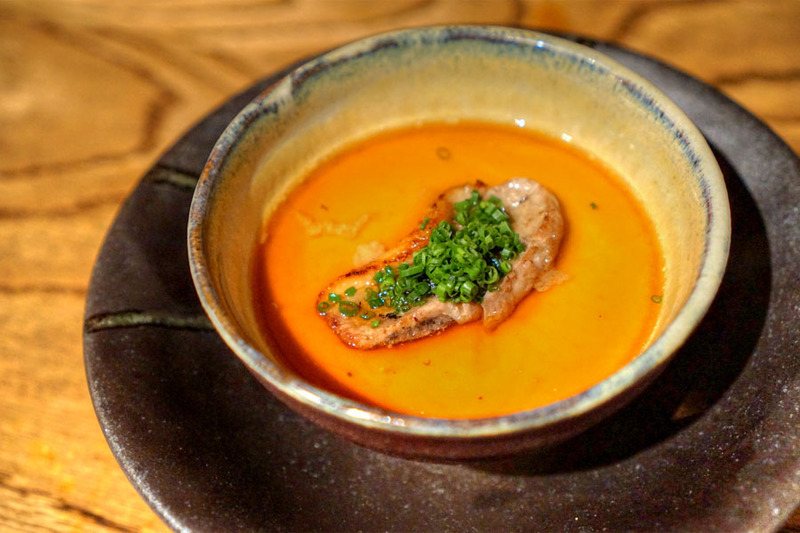 Given the prevalence of high-quality Japanese cuisine in LA, I'll have to concede that Raku doesn't seem as "special" as it does out in the desert. Even so, the food's good, and this West Hollywood outpost represents a very reasonable approximation of the original Vegas restaurant. 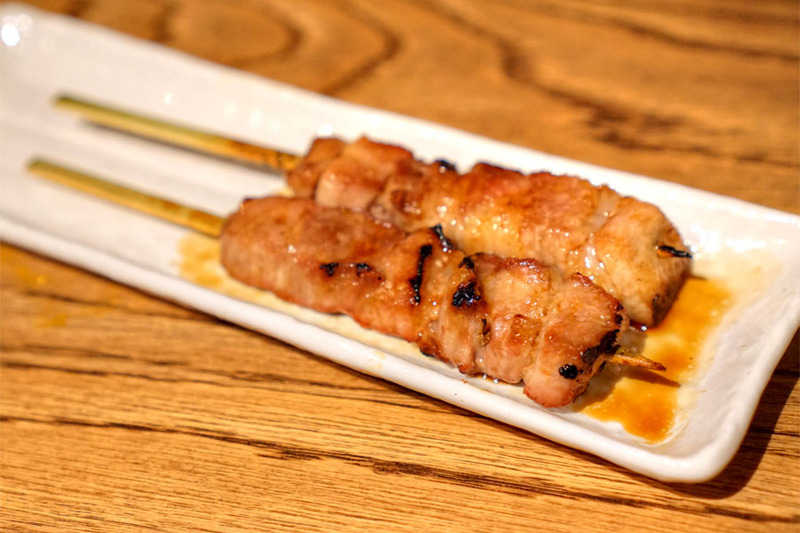 A worthy addition to our City's izakaya dining scene. 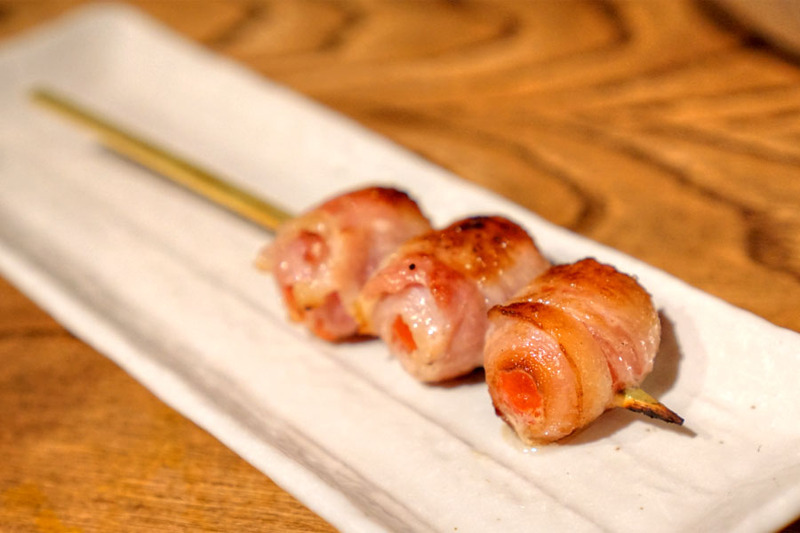 Which izakaya is your favorite? 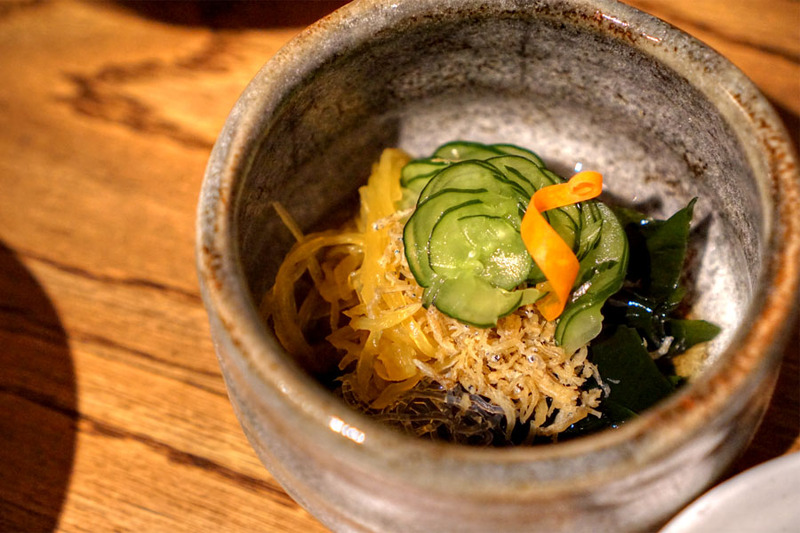 Raku is one of my fave places to dine in Los Angeles, so eager to try someplace you find even better!